What is the difference between maroon, burgundy and ox-blood? 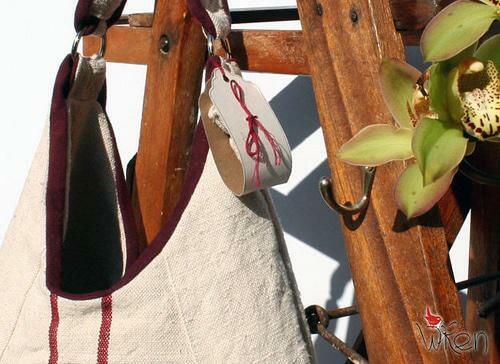 Maroon comes from the French word maroon (“chestnut”) and is a brownish-red like the suede leather on this ‘antique linen and leather bag’. Did you know that the word maroon used as a verb is to put (a person) ashore on a desert island and abondon that person there, as pirates or mutineers sometimes did (ref). Ox-blood is also said to be a brownish-red colour but richer and brighter than maroon. The pigment comes from a rare type of Italian coral but the colour is said to look like that which an ox bleeds, hence the name. Burgundy is a colour name that has its origins in a French wine region and it refers to red wine. The first recorded use of burgundy as a colour name in English was in 1915 so it is a relatively new name. This is the colour of the double stripe that runs through this ‘antique linen and leather bag‘. This entry was posted in Blog and tagged burgandy, burgundy, Colour, colour name history, Colour names, dark red, maroon, marron, ox-blood, oxblood, red, red coral. What a lot of Fiiissh! The other colour name I found interesting is “Puce”. The name “Puce” has it’s origin in French (first used in 1787) and literally means “flea”. It became a colour name for describing the colour of the belly of a flea which is dark reddish-brown or dark purplish-brown.